Factory UTV’s Polaris RZR XP4 1000 UHMW Skid Plate is in production. The stock XP41K “skid plate” will simply not cut it when it comes to protecting your machine. 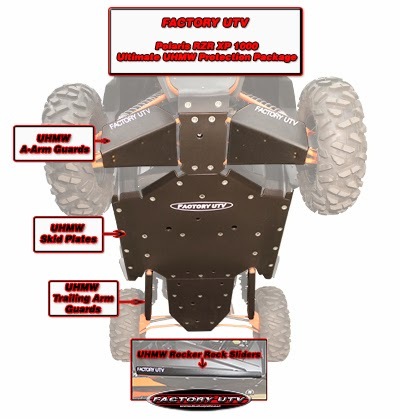 Factory UTV, the industry pioneer in UHMW UTV protection has the answer withour 3/8 in and ultra tough 1/2 in skid plates. You didn’t settle for a cheap Chinese knock off UTV, so don’t settle for a flat piece of plastic as a skid plate. Our skids are molded to fit the contours of the XP41K making installation 100% easier and making the skid less likely to pull loose. The top factory race teams from Polaris, Can Am and Arctic Cat rely on Factory UTV skids, because we are the best in the business bar none!